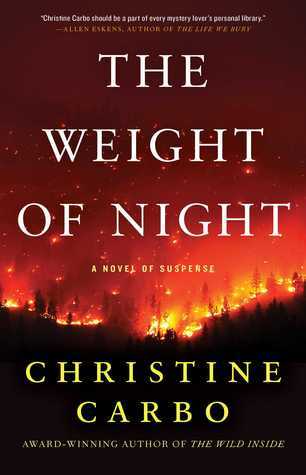 The Weight of Night is also book #3 in the Glacier series. It has a good suspense thread into the storyline with a couple of interesting subplots too. I think I would have enjoyed it more if I knew the characters from prior books. The story develops in Montana. Specifically, in the Glacier National Park. At the beginning of the novel, firefighters are fighting a wildfire affecting the park. During the process, they uncover the bones of a young male but due to the fire, they have to move fast and get the local CSI involved ASAP before the fire destroys the evidence. Monty Harris is a park police officer. He's divorced and still dealing with the loss of his best friend Nathan when they were younger after Monty's brother's prank ended badly. Nathan's body has never been recovered. Finding the skeleton of a young male makes Monty wonder if this could be Nathan. Gretchen Larson is originally from Norway. She left her home when she couldn't deal with her past any longer. She's part of the CSI team and she's called to unearthed the remains. Little by little, we learn of the tragedy surrounding her life. I like both main characters. I like their interactions and I'm hoping a romance will develop in the next book. The suspense was good enough and learning more about Gretchen's difficulties made her more likable too. Even though, the story was slow at times it still kept my interest. These two damaged characters were both well written.